Most of the time, glasses are amazingly convenient. Unlike contacts, you don’t have to worry about a lens falling out or scratching your eye. Glasses are easy to put on during a rushed morning, and they can add style to an otherwise simple ensemble. However, we can’t ignore one area in which traditional glasses lenses fall short: bright sunlight. When the sun is shining in your eyes, you can’t wear sunglasses on top of prescription eyeglasses. You can only reach for a pair of prescription sunglasses or a clip-on sun visor to attach to your frames. It can be hard to keep track of an expensive pair of prescription sunglasses, and not everyone loves the look of a clip-on sun visor, but it’s dangerous to expose your eyes to harmful UV rays for the sake of convenience, cost, or good looks. Enter transition lenses. This type of eyeglass lens darkens when exposed to sunlight. Learn the pros and cons of transition lenses, so you can decide if they’re a worthwhile purchase for you and your eyes. One obvious advantage of transition lenses is their convenience, but they also can protect your eyesight. Transition lenses protect your eyes from the sun, requiring no additional action on your part. Did you know that cataracts are a common condition among American adults? The National Eye Institute estimates that 20 percent of cataract cases are caused by extended UV exposure. While eye surgeons can often correct cataracts, there’s another, more permanent eye issue the sun can cause: Macular degeneration, which is a result of damage to the retina, is the leading cause of blindness in the United States (source). If you have a hard time remembering to wear sunglasses to protect your eyes, transition lenses might be a good choice. Transition lenses can also save you money. Rather than purchasing two pairs of glasses – one with prescription lenses and one with transition lenses – you can purchase one multi-use pair. It’s also a cinch to keep track of transition lenses because you wear them all day. Even if you try to keep an eye on your prescription sunglasses, you could easily misplace them or even lose them for good. While transition lenses come in handy on the beach, a sunny road trip, or even a day running errands, they do have drawbacks. Let’s just say you’re on a vacation enjoying a day of sightseeing. If it’s a sunny day, each glimpse you get of the Eiffel Tower, Big Ben, the Grand Canyon, or the Great Wall of China will automatically be a shade of brown, black, or blue. If you were wearing contacts with sunglasses, you could simply take off your frames and see the attraction in all its true colors. As it is, you’ll have to settle for tinted vision (glasses on) or blurry vision (glasses off). Another disadvantage of transition lenses is that not every pair transitions quickly, and some brands perform better than others. It may take several minutes for your lenses to transition back to normal when you enter your office after a sunny commute. Temperature also affects the rate of the transition. In the winter you might notice your frames take a little longer to darken. And unfortunately, some brands don’t work as well in cars. 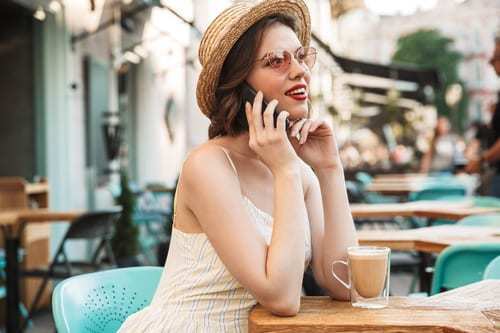 If you still want to enjoy the benefits of transition lenses, it is worthwhile to experiment with different brands until you find the right one for you. If you have additional questions about the pros and cons of transition lenses, consult with your optometrist. Are you looking for a caring eye professional in southwest Missouri? Contact Heffington’s. Since 1975, the Heffington family has been assisting the Springfield community with top-quality eye care and affordable eyeglasses and contacts. To learn more about our products and services, please get in touch with us online, send an email to asktheexperts@heffingtons.com, or give us a call at 417-869-3937 (Optiland location) or 417-882-3937 (House of Vision location). We look forward to hearing from you!